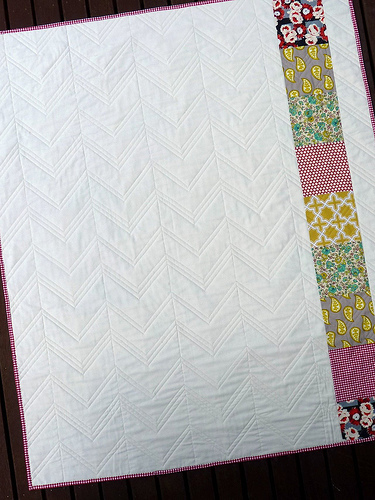 The Modern Flying Geese Quilt is quilted and complete with binding. Quilting in this zig zag pattern is cumbersome with the quilt having to swing to and fro whilst the sewing machine is in the needle down position and the quilt firmly sandwiched in there. As much as I look forward to the quilting, I am always a little surprised by how soon into the process I find myself wishing it was all finished. The back of the quilt is pieced with fabrics that are also used in the front of the quilt. The solid backing fabric really allows the quilting lines to stand out and makes a feature of the zig zag pattern. I have used a small red and white woven check fabric for the binding. When using a check for binding fabric always take extra care cutting your fabric strips, ensuring the you cut in line with the checks. The Modern Flying Geese Pattern (pdf file) available here. I am also itching to get started on some new projects! Your finished quilt looks beautiful! Have you tried free-motion quilting, and still using your straight lines? 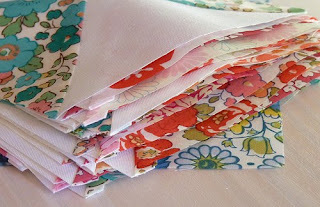 A little time to master, but it would make your quilting a lot easier--less turning of the fabric. This is a great quilt, and the back is so pretty. Love how all the quilting shows up so well there. Lovely quilting! I love how the echoed lines go into the flying geese - great work. It looks beautiful! I know how you feel about the quilting — it can be so taxing, but it really makes the finished product. ps: Love those vintagey florals in your last pic! I love all of your quilts. I like the zig zag machine stitching. I think "quilting the quilt" is an area many of us struggle with. It will be a wonderful inspiration for your students. I love flying geese in just about any arrangement. Yours looks great with the arrangement and the fabrics you selected. Love that checked binding. Now, that quilting is just lovely. I love your pattern, thanks, and am leaning towards a blue and white Kaffe! Another stunning quilt. I love the piecing on the back, and the quilting is fabulous. It was definitely worth the effort. I hear you on changing directions when quilting, particularly when it is a large quilt! It's beautiful! I LOVE all the bright fabrics contrasting with the crisp white background. This is a lovely quilt. I really like it. Very nice job. I've just got your flying geese pattern and am about to start making my parents-in-law a 40th wedding anniversary quilt. Might need your virtual advice ;). Your finished quilt is an inspiration. You would never know you were wishing the quilting bit finished. Especially after I saw what happens when I wish the (machine) quilting bit finished! Ahem. it looks wonderful, Rita! 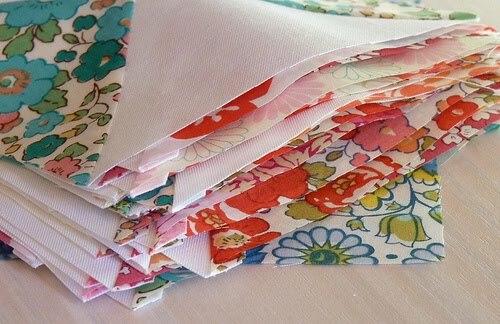 So does the sneak peek of your next project - liberty prints, yum! 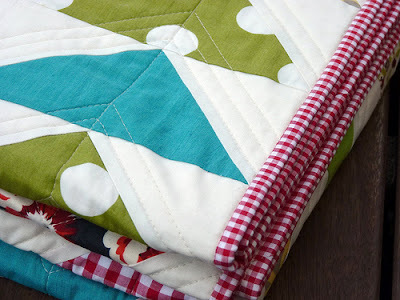 I love the quilting on this quilt - how do you keep your lines so straight? Maybe a subject for a mini tutorial? Thanks for all the inspiration! Love this quilt & am ordering the pattern. 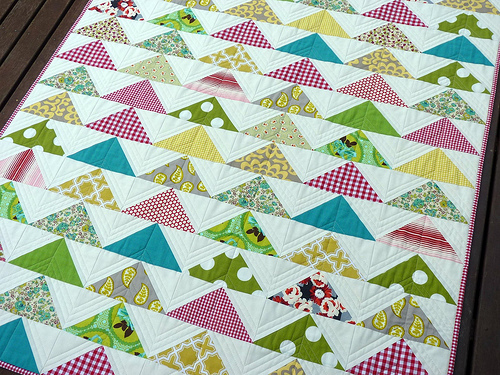 How do you mark your lines for the zig-zag quilting? Your lines are always so wonderfully straight. I love the binding you used! while the quilting is a bit of a pain it really makes this quilt fabulous!! 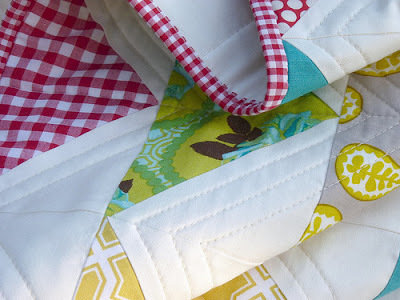 your quilt is fantastic...i really love the quilting you have done and the back is absolutely wonderful too! I love the stippling that you have done on this quilt! It just makes it look so smart. Oh! This is so, so lovely! And kudos to you for sticking with the zigzag quilting. I tried that once. Once. I think I got about half-way into the first row and decided that I did NOT have the patience :) Thanks for sharing this with us!! I loved the first version. I love the second version. They are both truly beautiful, full of visual interest. Really cute. The checked binding is awesome! Hard work, but the quilt looks so much better now that it's quilted. It adds a wonderful dimension. Honestly, I didn't like it for some reason before (I almost liked it, but something was off for me). Now that you added that quilting, I can see making one someday. I love your use of solids! Rita, I love how you echoed the flying geese with your quilting!!! Your stitching lines are so perfect! How do you do that?!? I have ordered your pattern and was hoping to finish a few projects before starting the flying geese. Not sure I can wait now that I see yours completed. I really like the modern fabrics you chose. This is so amazingly darling. I love it. Your quilts are always so inspiring to me. The quilting really makes this quilt. Great job! This quilt is beautiful, I think it's one of my favourites. The quilting on the back looks gorgeous, you should be pleased. Gorgeous! I'd be so nervous to use that gingham for the binding, worried it wouldn't line up perfectly straight. Yours is awesome! So beautiful and crisp! Your quilting is amazing how perfect and I love how it shows off on the back! Can't wait to see the new projects you are starting!!! as always, beautiful! love the zig zag quilting and I can imagine all that turning!!! i know your pain!! i'm not doing much quilting on it... but i'm working on a zig zag one & it's driving me bonkers! What a beautiful creation...I'm inspired!